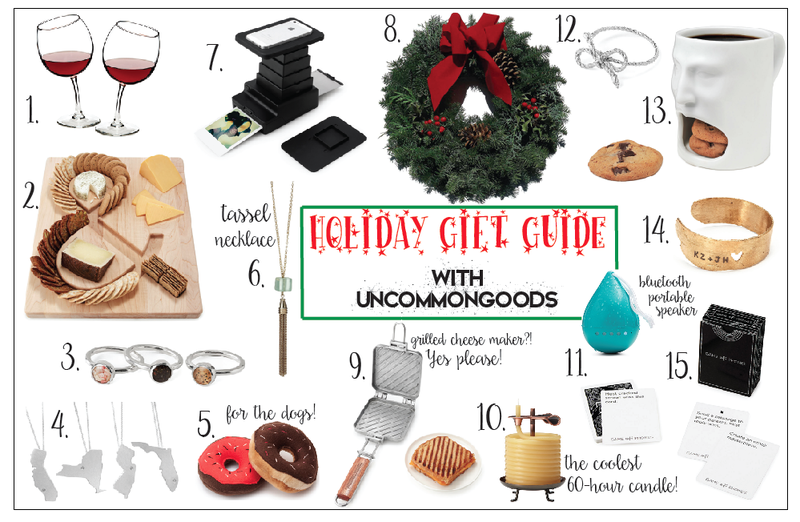 With the holiday season in full swing, I thought I would create a fun little holiday gift guide to share some of my favorite gift items from UnCommonGoods. UnCommonGoods is a privately-owned retailer that features unique jewelry, decor, and handcrafted items. Did you know that with every purchase you make, you get to donate $1 to the non-profit of your choice with their Better to Give program?? 'Tis the season for giving! You can find more gift options here. 1. How fun are these tipsy wine glasses? Ha! Snag a set of 2 or 4 for your next holiday party, or gift them for your gal pals and family. If you feel like you're "sipping away," at least you can say that your wine glass has you beat. 2. My "type" of cheeseboard. Get it? 3. I love stacking rings. They make for the perfect dainty pieces, when trying to go minimal on the bling. Not to mention, these are handmade. You can find more handmade jewelry here. 4. Show off your state with these customized state necklaces. These type of necklaces are a great idea for gifts! 5. If you own a dog, this is for you! ...Or, I mean... your dog. Your dog deserves something sweet this Christmas. So why not try this donut squeaky toy? 6. I love a good tassel necklace. I love that the cube is hand-cut from a glass bottle. How cool is that? You can find more necklaces here. 7. Print my favorite photos from my smartphone with this instant photo printer? I'm sold. 8. This doesn't have to be a gift. Maybe you've been on the hunt for a new wreath for your front door? This one was too cute to not share! 9. Three words: grilled cheese maker. And it's only $25? Gift your favorite people this grilled cheese maker and they'll love you forever. 10. I was drawn to the design of this candle the minute I came across it. The coolest part is that a three-inch section burns for approximately an hour... and it's called a 60-hour candle. So now you know how long you have until you need another one. So cool. 11. This bluetooth speaker is water and sand resistant. 12. A little holiday bow ring for the ring lovers out there. More jewelry choices here. 13. A multi-purpose mug for milk and cookies. Or you can even store a donut in there. NOM. 14. Now you can have your crafted lovers' name into bark...everywhere. I love that this personalized birch cuff is handmade from real birch bark. 15. Think you're the fastest and funniest message sender on your smartphone? Why not put it to the test with this Game of Phones. Play it with your friends or make it a stocking stuffer for your tech-savvy sister or brother. The name of the game is just enough to interest me... just saying. Did you enjoy this gift guide? Do you want to see more gift guide posts leading up to Christmas? I haven't been able to make any because of finals, but I'll be done next week! This post was sponsored by UnCommonGoods. All thoughts and opinions are my own.